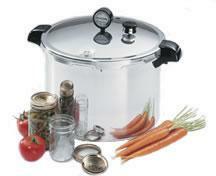 Presto® Pressure Canners also double as water bath canners for preserving fruits, jams, jellies, pickles and salsas. Canners are constructed of extra-strong, warp-resistant aluminum and are suitable for use on regular and smooth-top ranges. Includes cooking/canning rack and complete instruction and recipe book.